Why is the library seeking a millage? The library's current millage expires at the end of 2019. Without the millage, the library would lose over a 3rd of our funding and with the remaining money would not be able to operate with our current hours, current number of staff or even offer our current services. Why is the library seeking a millage increase? The library is seeking to increase its millage to .798. 9 years ago the library passed .3 of a mil. Since that time we have been reduced by the Headlee Amendment to .298, putting us on the lowest percentile for publicly funded libraries of our size. In fact, we are one of only 2 libraries that levee only one millage at less than .4 mils, with the average being .9180 for townships/libraries of our size. Even when leveeing .3, we were not able to function without extra support of the township. Recently, we have asked for another increase from the township which we feel will only add a little extra wiggle room in case of an emergency. Most public libraries are funded primarily by a voter passed millage, penal fines, state aid, and miscellaneous income that includes fines, fees, grants and donations. How is Dorr Library funded? 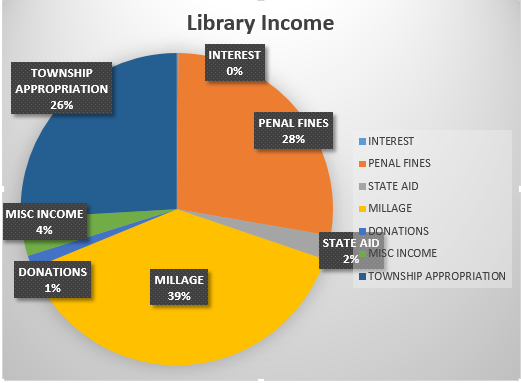 Our library is currently funded primarily by a voter passed millage, a township appropriation, penal fines, state aid, and miscellaneous income that includes fines, fees, grants and donations. Millage: The library is primarily funded by local property taxes. Our .298 millage makes up about 39% of our current budget. Penal Fines: The library’s next highest contributor for income is local penal fines. This source of income has been steadily decreasing over the years and many libraries can no longer rely in it as a signification source of funding. Township Appropriation: Dorr Township supplements the library’s income by a little over 25% in order to help us provide our current level of services to the public. What will be funded by the increase? The library seeks to enhance library services within our current building in order to meet the needs of the community in the following ways. 1. Hours –Currently we open at 12pm two days a week and at 10am 4 days a week, which causes much confusion. To even out operating hours and to allow the community more access to the library, we would like to open at 10am Monday through Saturday. An increased budget would account for extra staffing to meet these new hours of operation. 3. Building and building insurance -- Currently through Dorr Township, the library's physical building and some of its contents are insured. Besides accounting for a needed increase in that physical insurance, the library would also spend millage dollars to purchase cyber insurance to help protect the library and the confidential information it holds from cyber criminals. - West entrance handicap accessibility. - For the long term, we would like to make eventual improvements, such as a gutter system, resurfacing the parking lot, repainting lines for the parking lot, laying new flooring in the entry area of the library, and putting up a new coat of paint in some internal areas. 6. The Future of the Library -- Our cooperative is also looking to replace the current system that we use to do all internal and cooperative wide functions. 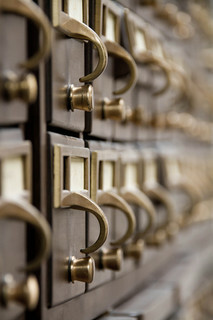 The new system, whatever system is eventually chosen, will cost a currently unknown but significantly higher cost for each participating library. What does Dorr Township Library offer? Dorr Township Library offers a wide range of materials and services. Our physical items available for checkout include books, magazines, DVDs, Binge Boxes, video games, comics, maker space kits (crochet, knitting, wood burning, etc. ), cake pans, and so much more. E-magazines, ebooks, Gale Courses (a database of professional courses), Mango Languages, and a number of other e-resources are available remotely to all our residents with a library card. Venture into the library to also use our library's online subscription to ancestry.com as well as attend one of our many crafts, programs, how-to sessions, or one-on-one tutoring. Participate in one of our yearly programs such as Summer Reading, the Chicago Bus Trip, and the Winter Bazaar. Have an idea for the library? We take requests everyday and would love the opportunity to work toward something new for our community.